October 30, 2014 February 10, 2016 ~ Sara W.
During the two weeks that my Mom was home on hospice before passing away from cancer, we were the recipients of many kind deeds from an abundance of people. One in particular that stands out still is an ice chest that arrived on our door filled with fruit juices, snacks, toys, and a variety of goodies. It was from two girlfriends of mine that I hadn’t seen in quite some time. When I first opened it, it seemed like such an odd menagerie of items. However, as the days passed and I needed drinks for visitors, snacks for kids, and a toy for my toddler daughter who was desperate for attention, it all made perfect sense. Years later, I received a phone call from a friend who was at a loss as to what to do for a friend of hers whose mom had just passed away. My friend was asking me what she could do for her own friend, as she knew I had experience with the situation. The ice chest immediately came to my mind. My friend took the advice and told me later how grateful her own friend was for the gesture. Since then, I have given greater thought as to how I can be of service to those around me in a way that is particular to their situation. We’ve heard this described in several different ways – do unto others, as you would have done to you; be the good; pay it forward; love thy neighbor; and so on. 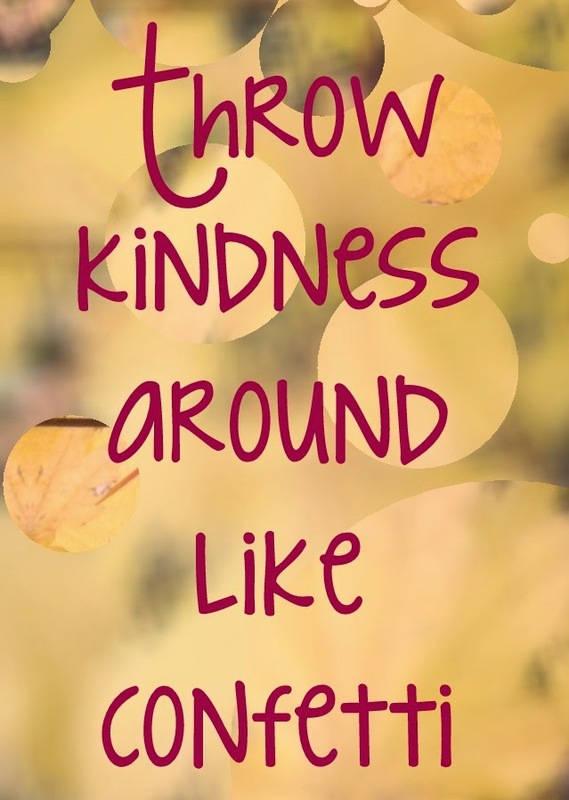 The motto I am going with lately is – throw kindness around like confetti! Confetti is like glitter, it gets EVERYWHERE! That’s what I want kindness to be in my life. I want it to be EVERYWHERE! I want to be like the waitress I had two weeks ago. She had overheard our table conversation of snow clothes needs for our kids. She immediately asked what sizes we needed for our kids. I told her and she said, “Let’s exchange numbers so that I can get you what I have.” She was true to her word too. She went home, went through her storage, found my kids sizes, contacted me, and handed a bunch of items over and let me know she would keep in touch if she found more stuff that would work for my kids. Sure you have a friend that might gladly hand over their used items, but a stranger? Not likely. And it’s not like snow clothes are cheap, trust me. For the sake of argument, though, let’s say you don’t stand in need of anything financially and you can easily give away snow clothes without a second thought. What then makes this situation that much more special? She was a woman who paid attention to the needs of those she came in contact with. Sure, she’s a waitress and she should be aware of an empty glass or a missing dish, but her role as waitress ends there. What makes her extraordinary though is that her kindess wasn’t a product of her customer-oriented occupation, it was something she obviously carried around with her everywhere and then threw it around like confetti. This is definitely an attribute that I need to improve upon, especially in our home. I kid you not, I raised my voice at my bickering daughters yesterday to tell them to be kind to each other. What sense does that make? Granted, I was in pain, impatient, and frustrated, but that is not an excuse. In fact, I plan to write a future post entirely about how that is not an excuse for poor behavior. I wasn’t throwing around kindness, I was throwing around a poor attitude and it was felt by the entire home. Because that’s how our moods and actions work, remember Attitudes are Contagious? So, my goal is to heighten the amount of kindness I show others and, when possible, make it more purposeful. I have started by following the example of that kind waitress. While I am not in a financial state that I can give away a bunch of stuff, I’m doing what I can. I recently posted a huge stash of infant clothes up on Craigslist for $30. It was an entire wardrobe for an infant boy and then some. Since posting it and having a person call to confirm the price, I have put several more items in the stack. There’s well over $100 worth of items in there now and it’s no longer limited to clothes, as I learned the recipient is a first-time mom. I don’t say this to boast of my generosity, because, frankly, I still feel a little guilty that I’m not handing over all of this stuff for free. I’m sharing it as proof that the kindness and generosity of that waitress has spread into our home and I’m going to make sure I get that kindness everywhere. What a wonderful time of year for all of us to increase our capacity for kindness. It’s so easy to get overwhelmed and frustrated during this busy time of year, when instead we should be slowing down, soaking it all in, and spreading kindness. I flash back to the scene in You’ve Got Mail when Meg Ryan gets in the cash only line at Zabars. Do yourself a favor and watch the clip. Then say to yourself, “I will be Joe, not Henry.” The kindness of Joe brings smiles to the grumpy. Go ahead and throw kindness around like confetti. Even better, come back here and tell me the impact that it’s had on the world around you, because it WILL make an impact. I know because the impact of the ice chest, a warm meal, flowers, snow clothes, care packages, cookies, free baby-sitting, and so very much more, has warmed my heart and brightened my day countless times.